If Music Be the Food of Love . . . PLAY on. Indeed, if Music is the food of love, Twelfth Night, or What You Will playing now at the Folger Theatre, is an amorous buffet. Hello! Emily Trask here! I had the pleasure of blogging with you last year while I was playing Valeria in The Gaming Table and I’m delighted to be back at the Folger playing another lady whose name begins with a V… Viola, and also delighted to have been asked to blog a bit while I’m here in Washington and on this isle of Illyria. 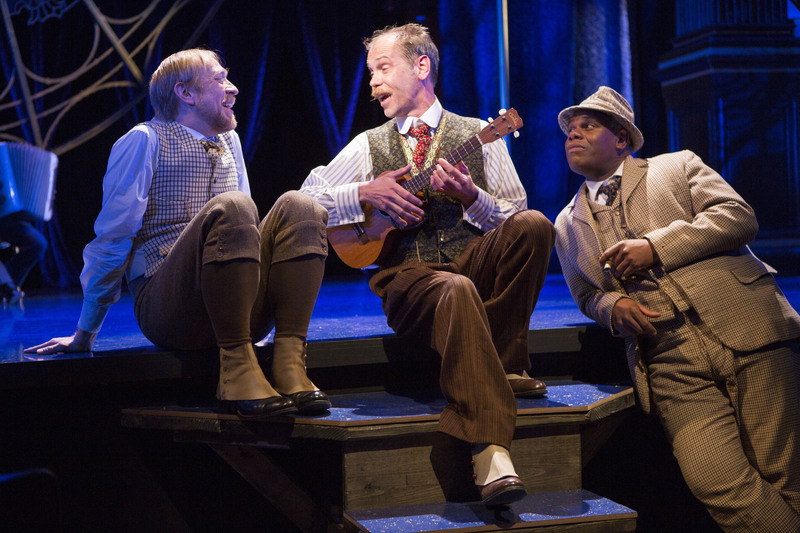 Feste (Louis Butelli) sings “O Mistress Mine” to Sir Andrew (James Konicek, left) and Sir Toby (Craig Wallace). Photo by Scott Suchman. 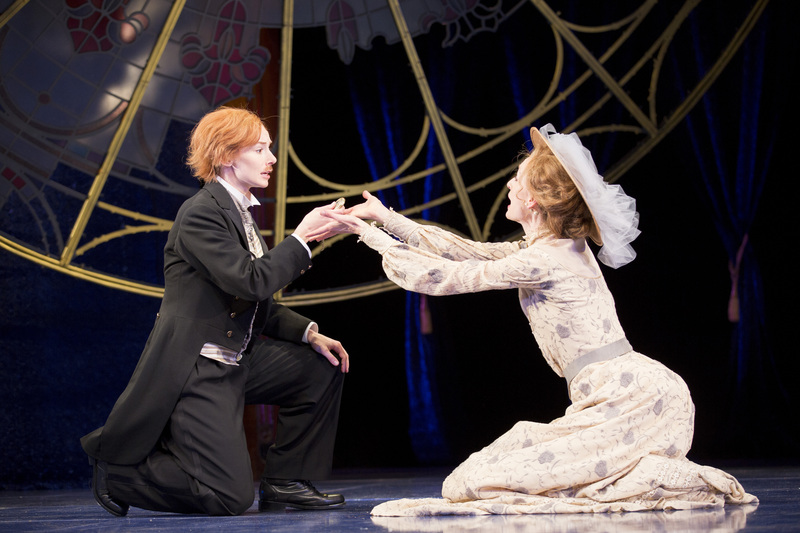 Twelfth Night, or What You Will has always been one of my favorite of Shakespeare’s plays. Perhaps it’s the effortless humor of the text – witty and bawdy alike. Or perhaps it’s the beauty of the character’s plights and journeys. 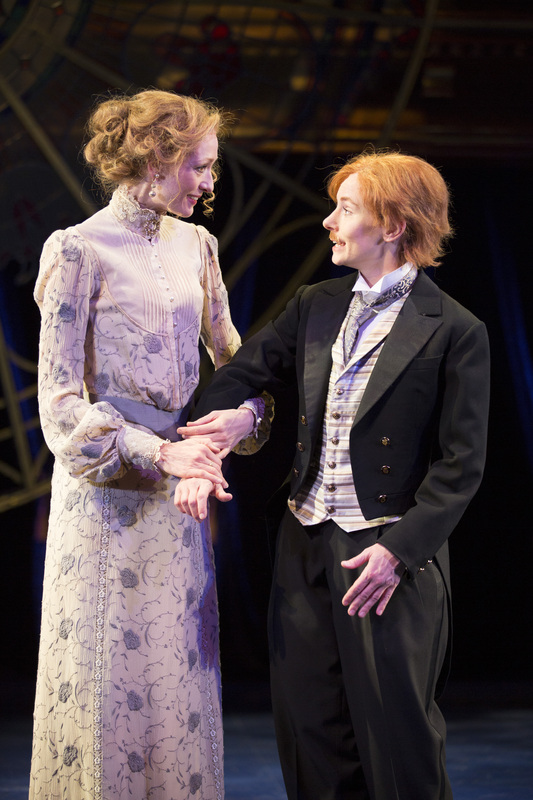 But more and more I seem to think that what makes Twelfth Night so enduringly wonderful lies in the realm of the intangible — that ineffable essence which is so innately human that Shakespeare manages to capture and store in the folds of this particular story. It is the play’s simultaneous effervescent yet profound bitter-sweetness, and the fact that beneath the moments of bawdy revelry, one senses there is something as swollen and dark blue as the sea that threatened to swallow the twins whose tale we follow. In many ways, Twelfth Night is a play about loneliness and longing; about being found when one fears they are irrevocably lost…about the discovery of love and laughter in the least likely places – Oh, and about having one hell of a good time while we’re at it! But even in light of any long list of descriptions, one is still hard-pressed to encompass the essence of this beautifully enigmatic play. However, a Spanish word comes to mind that might touch on the depths of this comedy: duende. Very loosely, duende means to have soul, rare depth and range of expression, and the ache of authenticity. Of course, the word encompasses so much more than that, but you get the idea. I first learned about duende in reference to Garcia Lorca and his plays. All right, all right. So the Shakespearean revels in Twelfth Night aren’t that closely akin to the fiendish flamenco of Lorca’s explorations. However, the second time I met the concept of duende comes significantly closer to the mark. It was in reading a lecture by Nick Cave, the famous Australian musician and front man for Nick Cave and the Bad Seeds, about what it takes to write a true love song. the Folger’s Twelfth Night is overflowing with the musical food Cave speaks of — and this is no mistake, but rather of an (oh-so-intentional) design. 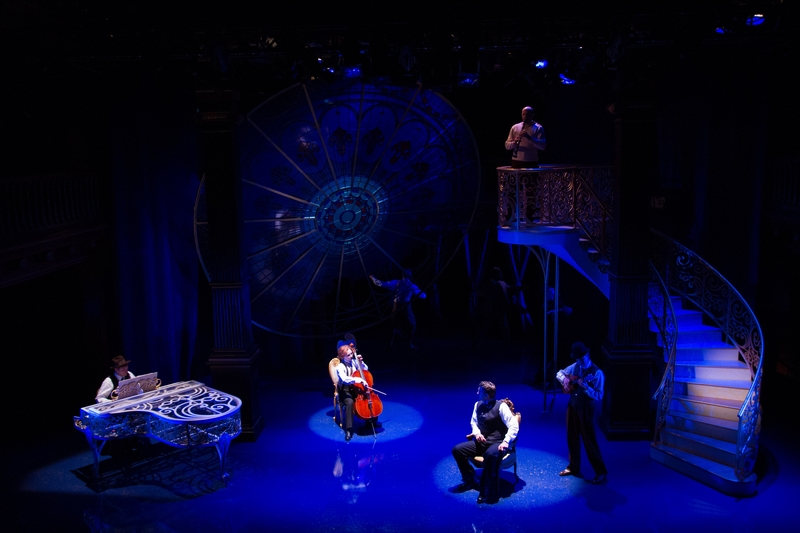 Specifically, the design of director Robert Richmond, of Sound Designer and primary composer, Matthew Nielson, and of the practical magic of maestro/musical director Joshua Morgan. 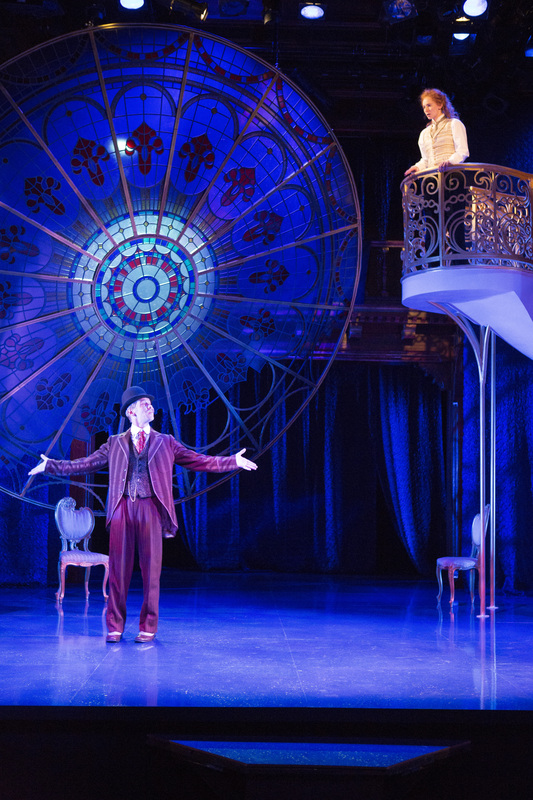 The numerous cast members who play and sing in the show thoroughly embrace and enact this amazing design. 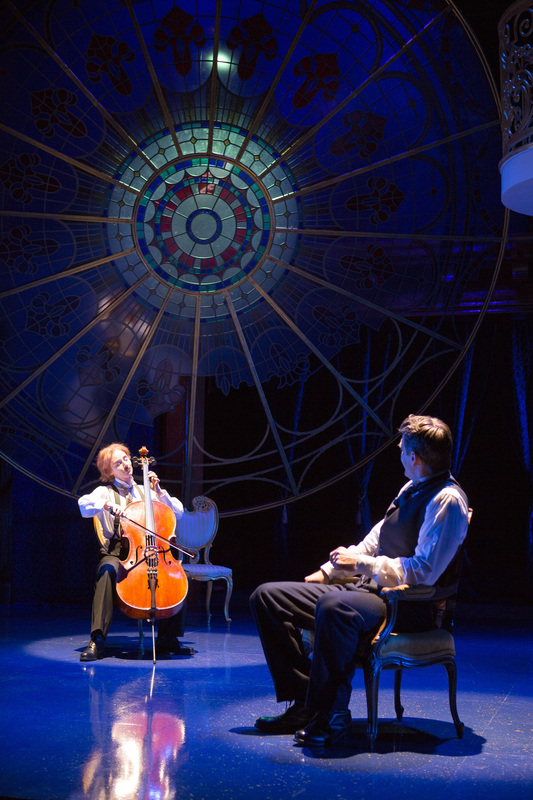 Cesario/Viola (Emily Trask) plays cello for Duke Orsino (Michael Brusasco). Photo: Scott Suchman. So for our mutual edification, I decided to go right to the source and ask the awesome and seriously gifted Nileson a few questions about our musical world. First, I was curious about where he gathered his inspiration for this play’s musical “sustanence.” Nielson said that he started with Shakespeare’s already bewitchingly scripted lyrics: “The lyrics for each song are written into the text, which by default becomes the biggest inspiration.” He said he was also inspired by the time period Richmond chose to set the production in, as well as by the composers that both he and Richmond were drawn to. These, and many other elements, combined to be the inspiration for the “first course” of Nielson’s composition and sound design. Viola (Emily Trask, left) finds herself in a rather awkward position with Olivia (Rachel Pickup). Photo: Scott Suchman. Feste (Louis Butelli) greets Viola (Emily Trask) on the shores of Illyria. Photo: Scott Suchman. Similarly, the characters themselves in Twelfth Night are an eclectic bunch of voices that find themselves thrust together in unexpected ways that create entertaining dissonance and harmony. In fact, most of the “sound design” that would normally be created by specific sound effects, etc. was done away with for live, in-person options. Joshua Morgan’s live accompaniment underscores a significant amount of the play and serves to heighten moments in scenes, and, of course, Louis Butteli’s “mellifluous voice” creates the change of place instead of shifting scenery. “For my part, I realized that between Josh’s playing, the songs we added, the songs I wrote and a few sparse design elements here and there, we had everything we needed,” Nielson said. “I worked with Josh and created varying layers of effects on the piano to achieve the different feels/ambiences/soundscapes in different scenes that I would normally create with recorded sound.” For example, instead of inserting underwater sounds at the beginning of the play when the twins may be drowning, there is heavy reverb on the piano which, when music is played, creates a distant and dreamy underwater feel. It is through the music that we experience the shifting world of the play. Not a bad concept for a play whose first scripted line is about just that: Music and the spirited feast that is about to be offered for our savoring with delight and deunde. Would you have a love song or a song of good life? A love song, a love song. What is love? ‘Tis not hereafter. Understanding Shakespeare is so much easier when it is explained with a loving and passionate attitude — which comes across so wonderfully in this post (and the ones by Mr. Butelli). I knew I enjoyed the music, but I didn’t fully recognize all the functions it had in the production. Reading this gave me more “Aha!” moments that will only increase my enjoyment when I see the show again this weekend. Thank you. That’s a great article. It has more useful information for music. I love music. I agree with you. Music truly brings peace to us. Thanks for sharing this.